"It's the most wonderful time of the year," sang the owner of a little mercantile with a lot of debt. For the kingdom's children, it is a time of wonder, a time of giving, and a time of cheer. For their parents, it is a time of work, a time of spending, and a time of breaking one's hip on an icy patch. Still, it's all worth the time, money, and risk of influenza to finally bring family and friends together in peace. Even if it's just for one cold winter's night. Even if it all goes away next morning over a fight for the last bite of pudding. It's November now, which means the holiday season had just begun... approximately two months ago right after Labor Day. Still, what better way to get ready for the holidays than with a vaguely-non-denominational-holiday-themed fan expansion of the greatest card game on ShuffleIT. 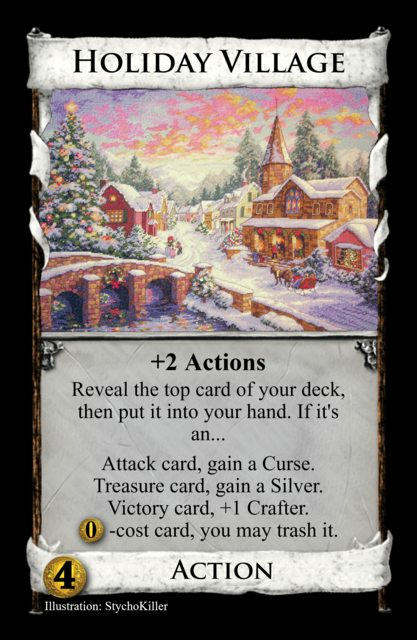 Crafting: This is the idea I "submitted" for the Create-a-Token contest in the Weekly Design Contest thread (yes, it was my contest, so I couldn't actually submit, but still...). It has been tweaked since then. Crafting is now a new phase between the Buy and Cleanup phases. If you have at least one Crafter token (i.e. 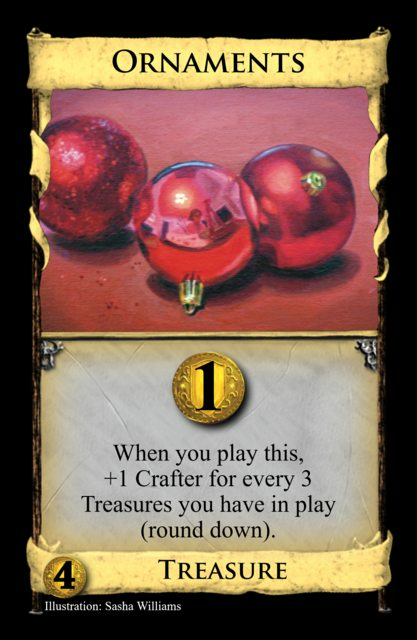 a regular coin token on your Crafters mat) you may spend them all at once to gain a single card costing up to $2 per token. If you have 4 Crafters, that's effectively a free Province. If you have 8 Crafters... that's effectively a free Province. 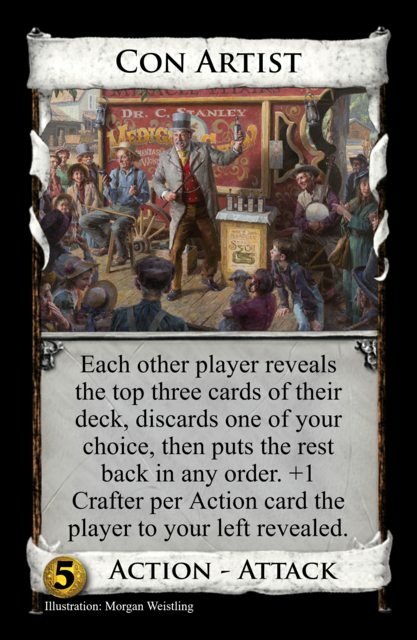 For the most part, cards will only give one Crafter at a time, and may be significantly gimped if they can give more than one. Helping Your Opponents: Peace on Earth, goodwill towards men, and all that jazz. Much like Council Room or Bishop, these cards give you something really good for the cost, but offset this by giving your opponents a little love as well. 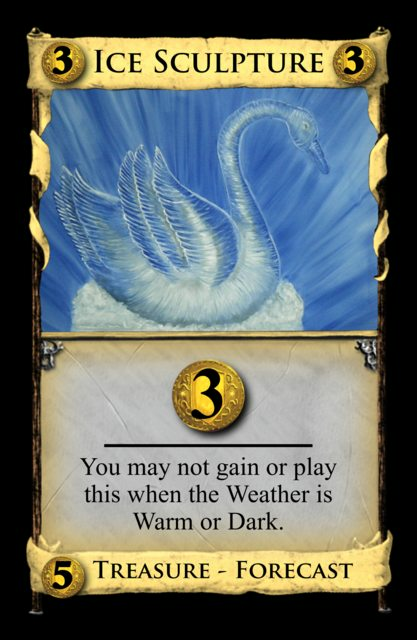 Winter Weather: I know that there have been attempts at Weather cards by other users (Aquila especially), but this is my take on it. 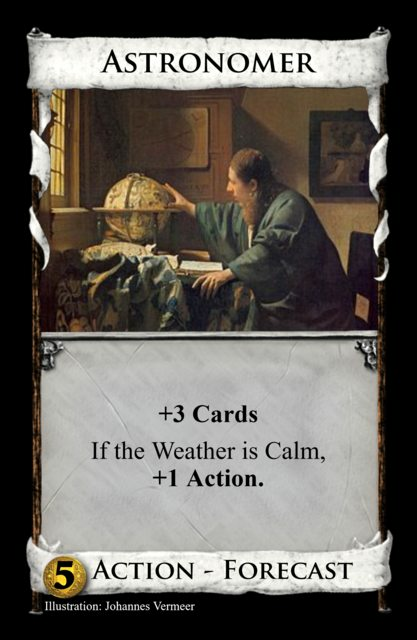 My set will have a total of 25 weather cards (9 each of Calm, 2 each of the 8 others). The Weather effect changes each round, just before the first player starts their turn (the first turn is always Calm). When all 25 Weather cards are discarded, the discard pile is shuffled and starts anew. 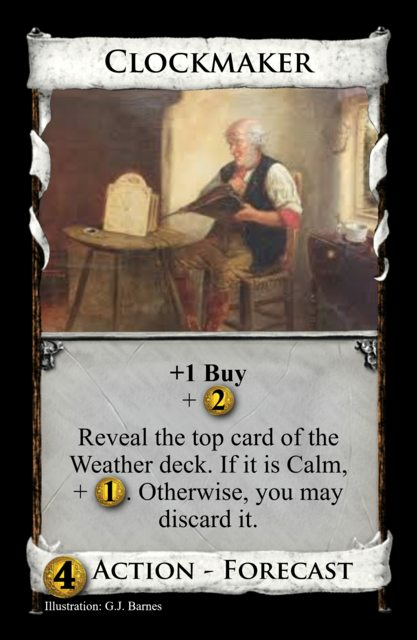 Weather only appears in games with at least one Forecast card in the Kingdom (or available through Black Market/Curiosity Shop (see below)). These Forecast cards can make use of certain conditions, protect you from the Weather, or even control the Weather to an extent. 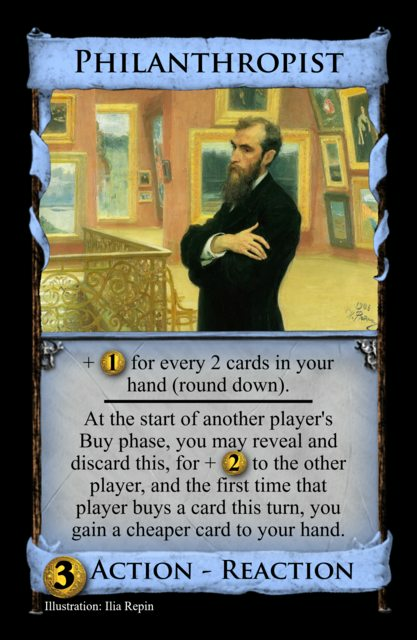 I will be updating and replacing cards over time (maybe adding, but I already have 25), and I need as much commentary on these as possible. I don't have much opportunity to playtest my cards, and I'm not asking anyone to do so unless you really want to. Still, any feedback is monumentally appreciated. Flavor text trying to explain why these effects for this name. If the Weather is Calm, +1 Action. He's just as useful as your average Smithy, but he truly shines when he can actually see the stars. A simple card to start with, and one that uses the Forecast mechanic to become really powerful for about 1/3 of the turns on average. The rest of the time, it's an overpriced Smithy. Perhaps it is a bit too strong for those Calm turns, but I'd need to playtest it to be sure. Gain up to 2 Coppers to your hand. Each other player may pass up to 2 Coppers from their hand to your hand. When you discard this from play, trash up to 3 Coppers in play. Here they come a-wassailing, now bring them a figgy pudding. 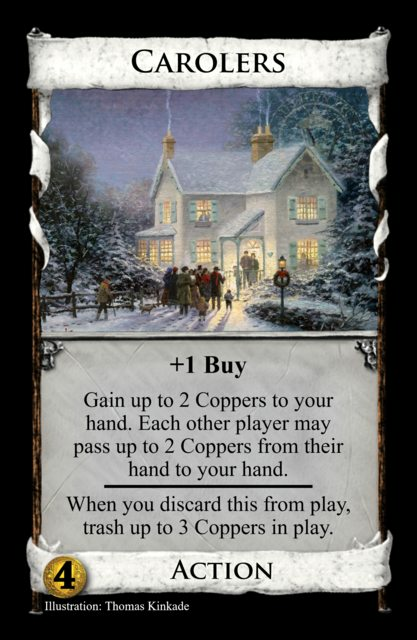 This is the third version of Carolers, and now the player can gain two Coppers without having to get them from others. Still something of a Beggars variant, but getting rid of those extra Coppers is pretty easy now. 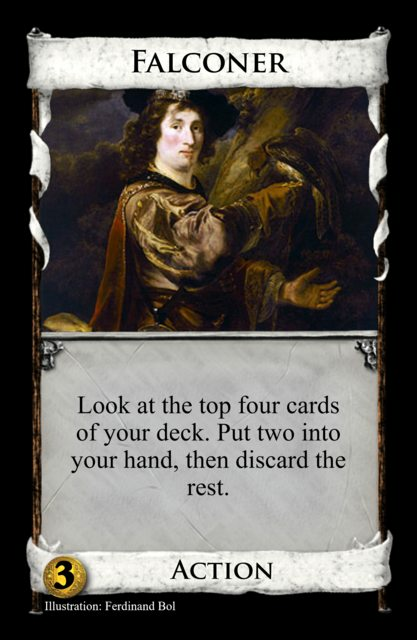 Each other player may trash a card from their hand. If anyone does, +$2. This poor peasant will clean out your dirty chimneys to earn some food for him and his dog. As far as "trash others' cards for cash" goes, I like this much more than Carolers. If no one trashes, it's a non-traveling Peasant. If anyone does, it's a Sacred Grove without the Boon, but you still help your opponent(s). 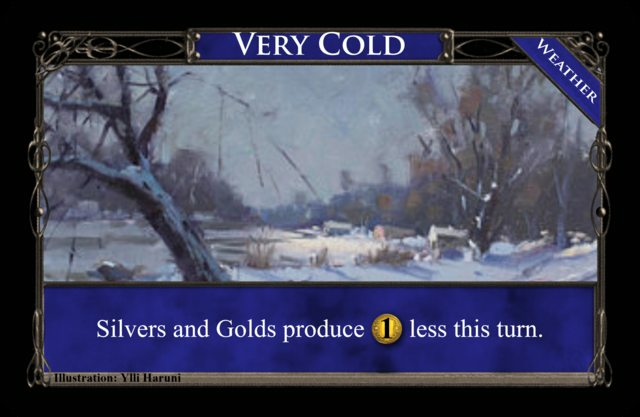 Reveal the top card of the Weather deck. If it is Calm, +$1. Otherwise, you may discard it. He cuts his own wood for his clocks, which can let you know if it's too late to risk going out in bad weather. This one also shares similarities with Chimney Sweep in that it's basically a Sacred Grove sometimes, and a Woodcutter otherwise. Still, it also gives you an opportunity to avoid bad Weather (or prevent your opponent from enjoying good Weather). I may work on the vanilla effects. You may trash a Treasure from your hand, to gain a Treasure costing up to $6 more than the trashed card. 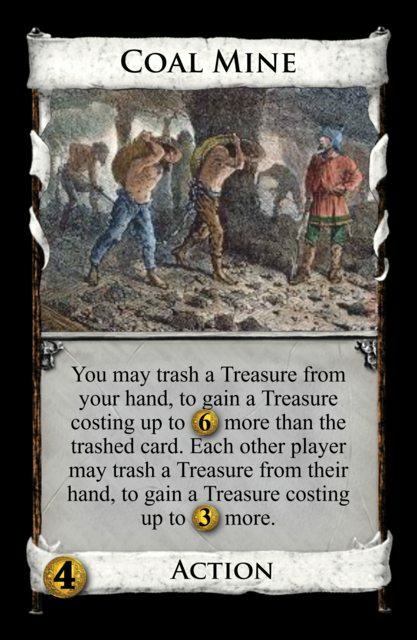 Each other player may trash a Treasure from their hand, to gain a Treasure costing up to $3 more. Any heat source in the wintertime is worth its weight in Gold, but we need to make sure everyone has some. Again with similar cards, this time somewhat comparable to Potato Farmers (though I think they're different enough). I wonder about the idea that opponents can trash a Silver for a Gold with less loss of opportunity as the player. Each other player reveals the top three cards of their deck, discards a card of your choice, then puts the rest back in any order. +1 Crafter for each Action card the player to your left revealed. He can hoodwink one out of three targets with ease, and the more people he meets, the craftier he becomes. One of my "submission" cards from the contest, but I wasn't too happy with +1 Crafter per differently-named card. This way, it may also help nerf opponents' engines. Without playtesting, I can't be sure exactly how strong Crafters can be, even with the caveat that you must use all Crafters when Crafting. Choose one: +2 Crafters; or empty your Crafters mat to gain a card from the trash costing up to $3 per Crafter. Setup: Put one copy per player of ten randomly-chosen Kingdom cards not in the Supply into the Trash. This place takes others' junk and turns them into needful things. I need to work on the wording for this one. Also, I wonder if it should be $2 per Crafter vs. $3. That said, I wanted to try a Black Market variant of sorts. When you gain this, if it's your Crafting phase, +3 Crafters. Otherwise, +1 Crafter. A mystical land chock full of creative folk. The idea here is that Crafting an Elven Forest is effectively free; you get enough Crafters back to gain another Elven Forest next turn. Of course, without other sources of Crafters in play, you'd have to gain three of these before you can get them for free. Is that too restrictive to make this interesting? Go immediately to your Crafting phase. 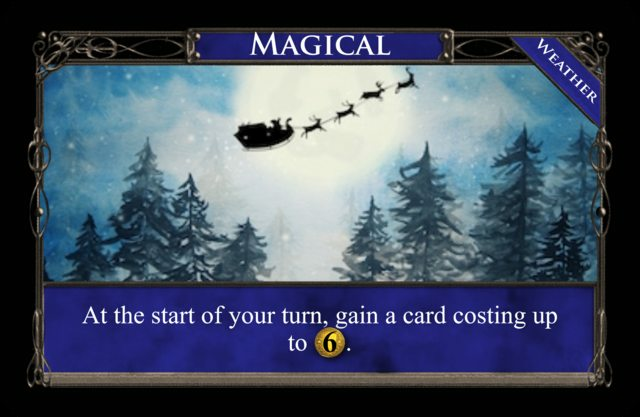 While this is in play, when you Craft a card, you may gain a second card costing up to $1 per Crafter returned. Working so hard to provide enough for my family, I forgot to buy what we need! Better whip up something from the scraps before I head home. I changed this from the contest thread, where it simply prevented playing any more Actions. Is the +3 Crafters and the second-card gain strong enough to offset the loss of a Buy phase? Edit: Added "While this is in play" to the bottom effect. Look at the top four cards of your deck. Put two into your hand, then discard the rest. Falconers can train their birds to hunt only the most useful targets. Originally, I had it as "Put one Copper and another card into your hand..." but decided that was far too weak. All in all, though, I wanted a few simple off-theme cards in this set. Edit: Changed "Reveal" to "Look at". Look at the top three cards of your deck. You may trash them all, discard them all, or put them back in any order. Look at the top two cards of the Weather deck. You may discard them both, or put them back in any order. Got pests? Send me their fur, and I'll make you a fashionable piece to keep you warm. Wording may need tweaked here. Essentially, this is a terminal Lookout where you choose one effect for all cards, which could be strong early game. I wonder if this is already pretty good compared to Lookout such that the Weather effect makes it too strong for a $3. 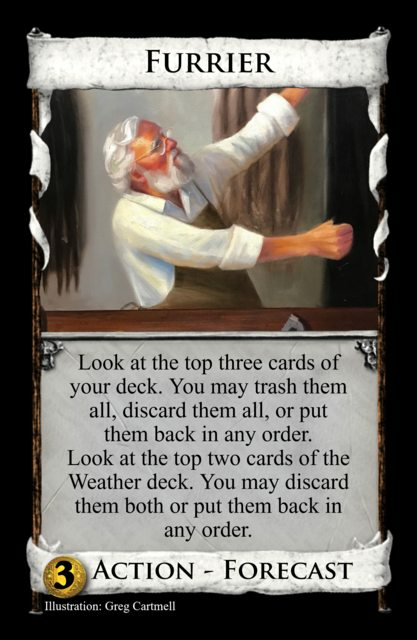 Perhaps discarding the Weather cards is too much? Attack card, gain a Curse. 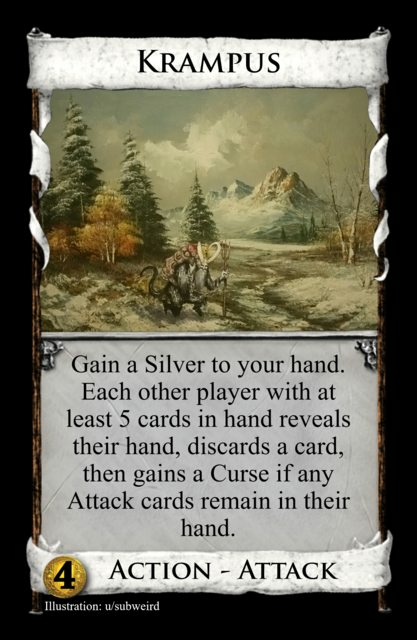 Treasure card, gain a Silver. $0-cost card, you may trash it. A peaceful, festive town where they'll make whatever you need and even soothe your soul. Why would anyone want to hurt them?! My first Crafter card idea, believe it or not. Originally had Victory cards give you +2 Crafters, but decided that was too strong. Each player reveals the top card of their deck. Each other player puts their revealed card into their hand if it's not a copy of your revealed card. It may not be much, but it's my place. No one can take that away from me. From a Village+ to a Village-. I really need to reword this, and I'm also thinking of opponents putting the card into their hand if it is a copy of yours. Fun fact: I used to live in Homestead, Iowa. You may not gain or play this if the Weather is Warm or Dark. A stunning work of art one day, a worthless puddle the next. A cheap Gold that becomes a dead card about 1/6 of the time. Otherwise, nothing wrong with a simple card every so often. How does this compare to other cheap Golds like Contraband or Cache, though? Gain a Silver to your hand. Each other player with at least 5 cards in hand reveals their hand, discards a card, then gains a Curse if any Attack cards remain in their hand. Are you a naughty child? If so, watch out for the Krampus! Compared to Bureaucrat, do you think this is too strong for $4? When you play this, +1 Crafter for every 3 Treasures you have in play (including this). You can never have too many decorations. The gaudier, the better! Originally a $3 card that gave Crafters for every 4 Treasures, and was more or less useless. The numbers got switched, and now is a much better card. +$1 for every 2 cards in your hand (round down). At the start of another player's Buy phase, you may reveal and discard this, for +$2 to the other player, and the first time that player buys a card this turn, you gain a cheaper card to your hand. He makes money by having thing, and by giving it away, he gets even more. This was the last card I came up with, and I simply wanted a Reaction that matched the "help others" theme. I want to work on this one. Each other player may reveal a Victory card from their hand. 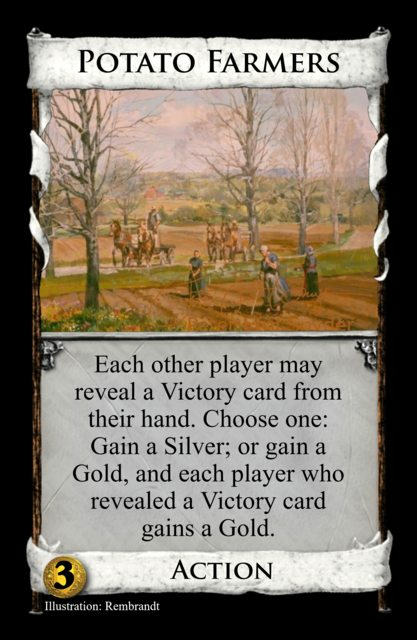 Choose one: Gain a Silver; or gain a Gold, and each player who revealed a Victory card gains a Gold. It's tough work, but if the crops are fruitful, we'll have goods for everyone who provided land. Gaining Golds and Silvers while potentially helping your opponents? In that respect, Potato Farmers already share that idea (somewhat) with Coal Mine. I may get rid of one or the other. 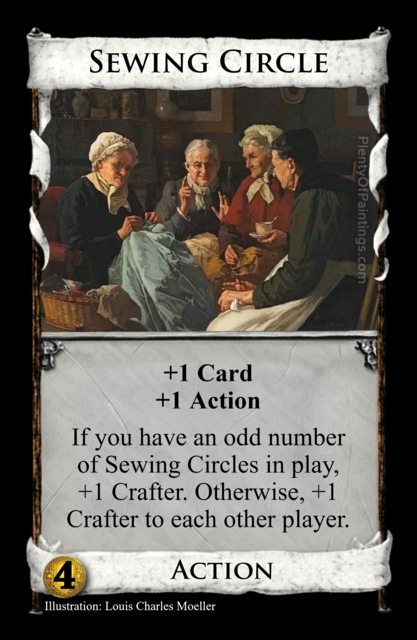 If you have an odd number of Sewing Circles in play, +1 Crafter. Otherwise, +1 Crafter to each other player. They can keep at it for the longest time. After all, they take turns giving and getting. I needed a cantrip in my set, so here it is. Playing just one is akin to a Baker, perhaps even better. However, more Sewing Circles means more Crafters for your opponents, so I think that evens it out. Choose one: Discard 3 cards; or each other player draws two cards. It's more fun with others; by yourself, you just end up back where you started. I just want to see more cards that draw and give economy simultaneously. I wonder if the draw-two choice is too much, though. Once you get to know her, she's actually nice and very generous. Still, her gifts are not always welcome. I wanted a nice simple Attack. Originally, it gave Curses to your opponents' hands, but that was too strong in non-Trashing games. This version still gunks up opposing decks, but not nearly as badly in order to compensate for the economy. 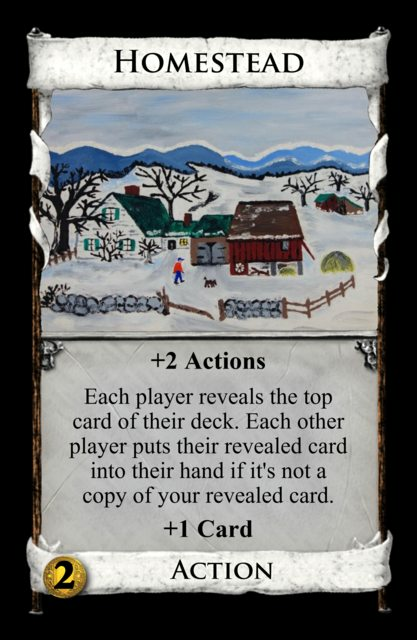 Some cards can also make use of Snow Witch's attack, like Counting House or Pooka. Gain a card costing up to $4. If it costs less than $4, +1 Crafter. Ever the frugal creator, any leftovers will become material for the next outfit. The wording still bothers me, but this came over from the Weekly Contest thread unscathed so far. While this is in play, you do not receive Weather effects. Tapestries served as insulation in the Middle Ages. There, that's the flavor text. Perhaps I could make it so that Weather has no effect whatsoever, so no +1 Action for your Astronomer on Calm turns. In any case, this means that both negative and positive effects miss you. 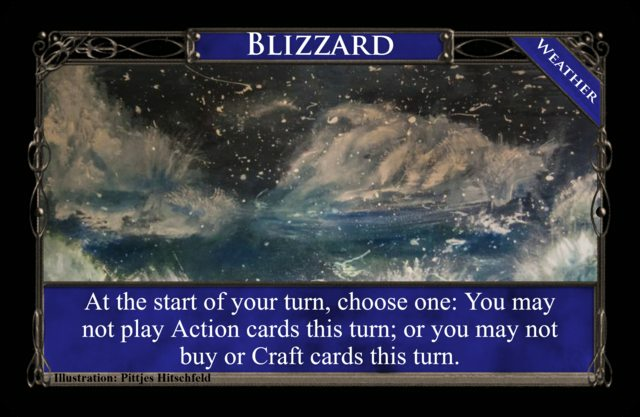 You can play Actions in a Blizzard, but you get nothing on Magical turns. Does that seem balanced enough? Edit: Reworded in-play effect from "Weather does not affect you" to "you do not receive Weather effects." anything else, each other player discards down to 3 cards in hand. Is it a storm-bringing monster? A misunderstood mountain man? Or even a generous spirit? Nothing much else to say here. Feedback, please! When you play this, you may trash two cards from your hand or in play. Otherwise, trash this. When you discard this from play, you may put in onto your deck. Keep the fire fed, and it'll burn for a long time. Once you're done with it, let it burn up. How good is this as a 5/2 opening gain? Too good? Often in the harsh winter, an uneventful day is often a blessing. There are nine Calm cards in the Weather deck, as opposed to two of each other Weather. I hope that seems like a good balance. At the start of your turn, choose one: You may not play Action cards this turn; or you may not buy or Craft cards this turn. This storm is terrible! I can still work or gather goods, but not both in this horrid weather. Clearly, this is meant to be the wickedest Weather effect of them all, as it effectively negates a whole phase or two. Is that too much, though? When you would draw at least two cards with an Action this turn, draw one less card. I can't see a thing. I better not work so hard, otherwise I could make a mistake. An engine blocker for sure, but cantrips and other cards are still okay. 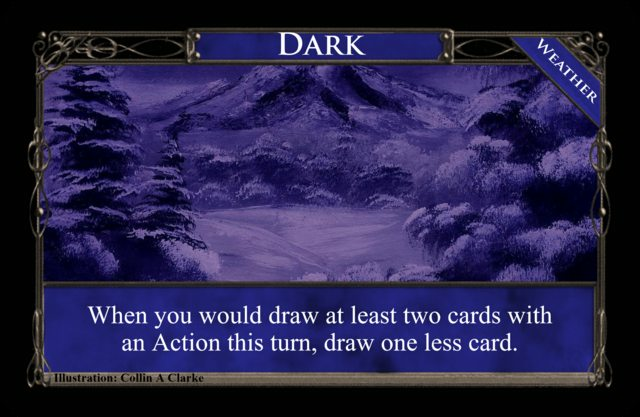 Does not effect "put cards into hand" effects like Falconer or Envoy, so those cards aren't afraid of the dark. When you play an Action card that does not provide Actions, go to your Buy phase immediately after resolving its effects. Like Dark, this hurts engines by effectively making Villages worthless. One terminal is it (Throne Room, King's Court, Golem, etc. still work as usual, but still end the Action phase afterward). I should change it to "When you play an Action card this turn" or something like that. At the start of your turn, gain a card costing up to $6. They know that Santa's on his way. He's bringing lots of toys and goodies on his sleigh. It's a holiday-themed set. I had to include at least one obvious allusion to this jolly old elf. Could benefit Player 1 a bit too much in the endgame, though. 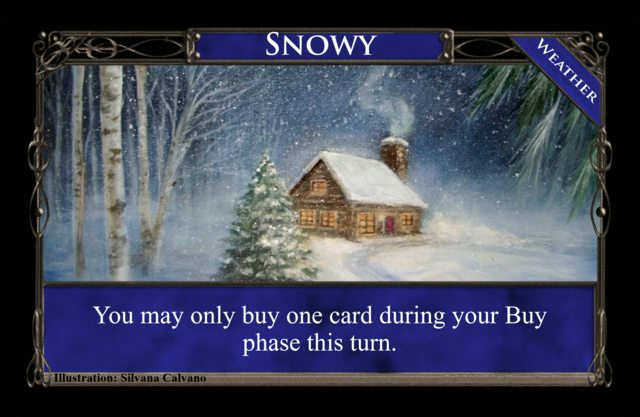 You may only buy one card during your Buy phase this turn. And since we've no place to go, let it snow, let it snow, let it snow. As Icy makes Villages worthless, Snowy makes +Buy worthless. Crafting and gaining cards in other manners is still fine, though. In Kingdoms without +Buy, it's mostly just Calm apart from some Forecast effects. Silvers and Golds produce $1 less this turn. Brr! It's so cold, even my assets are frozen! Enough with the engine stoppers; now we have a BM stopper (don't say that out loud, please). At least economy actions, Kingdom Treasures, Coppers, and Platina (for some reason) are unaffected. At the start of your turn, choose one: +1 Cards; or +1 Actions; or +$1. It's not freezing outside? Wow, I can actually do things now! The other truly positive Weather effect. Again, could give more to Player 1 in the endgame. At the start of your turn, discard 2 cards, then +2 Cards. Wow, the wind is harsh! It even blew my hat away! I better get my spare. While this can be harsh at times, there are situations where this could be beneficial. Perhaps I should switch the name with Snowy, as snow does have a romantic property to it at times. This is a more developed and convincing take on the Weather than my attempt. The big issue I found that put me off at first was swinginess; one player gets a significant lead or falls behind entirely by chance. My solution to soften this was to make the effects weak, but making them a bit bland in the process. Going with exciting effects with various ways to control the swinginess looks far more promising. The effects don't alter the opening turns much (the forced turn 1 Calm making extra sure), which is good, except for turn 2 Windy and +card Warm, which could get the first buy into hand to play for some players and not others; forcing Calm on turn 2 as well would be completely safe whilst not compromising much. Blizzard and Warm giving related choices is excellent. Astronomer makes Calm turns mega turns, which is either fun or by making every Weather do something it emphasises the swinginess too much. Clockmaker softens the harshness, which gives players incentive to buy it. The woodcutter bit fits well. Furrier similarly, though it can try to control the swing in your favour by making the top of your deck and the next Weather line up well. This control ultimately lies more in later players' hands; possibly annoying, or a clever way to soften first player advantage. Ice Sculpture is thematic, but it doesn't feel that exciting. Tapestrier keeps you out of the Weather, yet not so permanently that it may as well not be there. Yeti is random according to the Weather, with a fairly good balance on the overall odds of each effect. It will either emphasise swinginess too much, or be more casual fun. So all in all it's great on paper. And then I wondered about the combination of mechanical themes in this set and saw that friendly interaction goes well with the Weather, and Crafters let you reliably do things for yourself with all the noise of the other two things going on. Carolers are very possibly game-breaking if someone Summons them on T1. So first of all, I LOVE the helping-your-opponent theme. Dominion needs more non-attack player interaction, and this is a great way to do it. I'm not totally sold on the Crafters idea; they seem maybe too similar to Coffers. Regardless, most of these cards look good. Philanthropist looks so awesome I actually want to play with it right now. I also love that Holiday Village and Krampus punish you for having Attacks. Coal for being a bad boy! Carolers is the one that immediately strikes me as problematic. I'm sure there's at least one way this can completely shut down an opponent before they even start building. Honestly, I think it should only trash one Copper per player. Even trashing 2 Coppers gives you a ridiculous +$6 while destroying your opponent's hand; this seems game-deciding even considering you're helping them get rid of junk. Added my descriptions of each card into the second post. Also, Carolers has been completely changed, so any discussion of Carolers before this post refers to the old version. Thank you. The new carolers seems nice for everyone near the beginning of the game, but terrible once most of the coppers have been trashed. It should probably still do something more than +1 buy if no one passes you anything. Yeah, I thought about that. 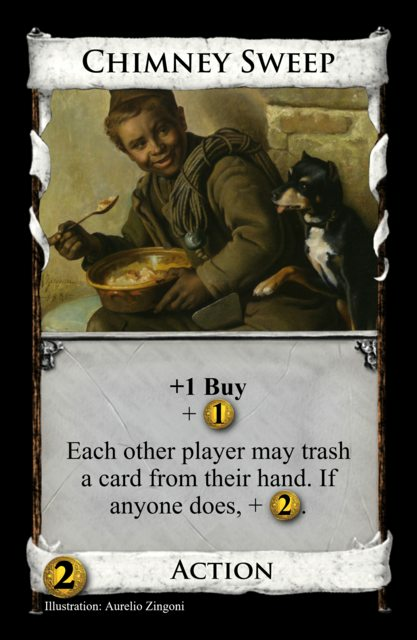 I still want a card that affects others' Coppers en masse, but perhaps Chimney Sweep is enough for allowing others to trash for your benefit. I'll keep mulling it over. Thanks for the feedback! Okay, I have one more attempt to make Carolers good. When you discard this from play, you may trash up to 3 Coppers in play. Basically, it's the old version of Coppers, but now you can gain a few Coppers (then trash them later) to make this effectively a Woodcutter. Or you can just get a Buy and trash Coppers assuming your opponents hold on to their Coppers. If this version seems pretty bad yet, I'll probably just ditch the idea and try something else. When you play this, +1 Crafter for every 3 Treasures you have in play (round down). Let me know whether you prefer these versions or the originals. Thank you. Astronomer seems possibly too good, though the fact that few turns will make this work make it rather swingy, definitely needs playtested. The new Carolers seems okay, but I think it would be better if you had each other player pass you coppers before you choose to gain coppers or not. 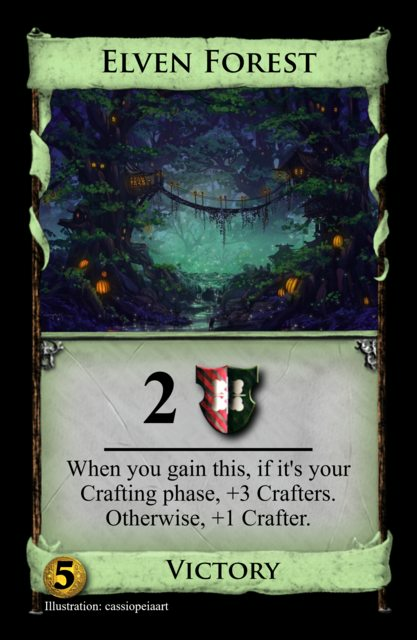 Elven Forest doesn't look like something often worth getting, except with other Crafter cards in the kingdom. If it cost $4 that might be better, since then Workshops, etc. Also, maybe just make it +2 Crafters. I don't really like Factory as it is. I think either ending your Action phase or Buy phase would make it better, but I don't know if there's a way to concievably word that. Or maybe, have it always give +1 Crafters, then you may go to your Crafters phase for +2 more Crafters. Furrier does look pretty good compared to Lookout, definitely drop letting you discard the Weather cards, I don't know if you should drop the Weather part completely or not. Holiday Village looks okay. Do you want it to be an almost negative effect when you reveal a Treasure? Often in an engine deck (this is a village after all) Silvers can be harmful, so if you wanted it to be better than you could change it to + $1 or $2 instead. Krampus does seem strong. Mechanically I think this would work better if a player either gained a curse or discarded a card, depending on if they revealed an Attack card, but that could get too wordy. The newer Ornaments looks good. Philanthropist and Potato Farmers look pretty good but seem rather political. Sewing Circle is interestingly enough the second card in an ice-themed set to have to do with whether you have an even or odd number of the thing in play, the other being Sleigh from Gazbag's Ice Age. I like the newer Snow Witch. I don't know if Tapestrier is very good, it just seems too swingy since you could miss Magical and still hit Blizzard. 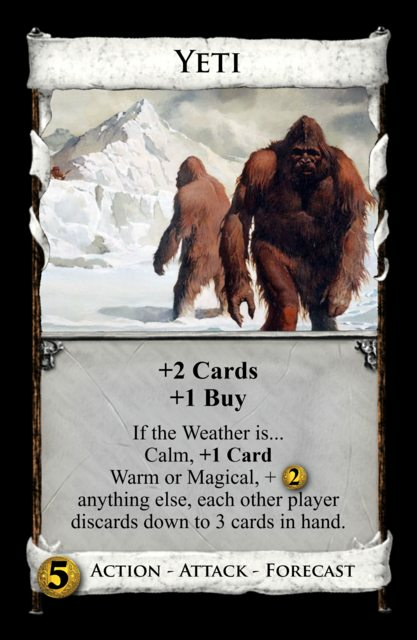 The next card here, Yeti, I think is an example of a good, less swingy card that utilizes weather (as opposed to Astonomer), as the effects do not vary too wildly. 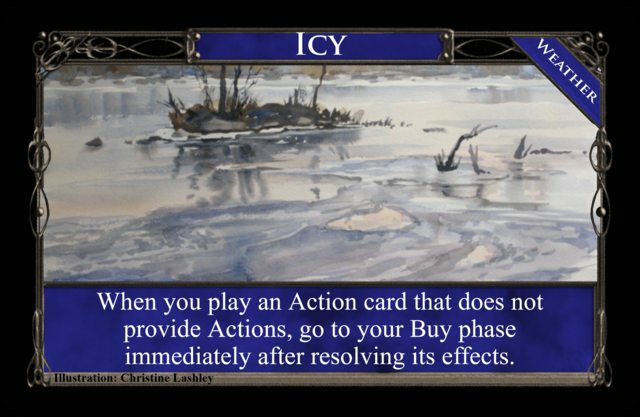 Something like +1 Action changes a card a lot more than + $2, or changing it from +2 to +3 Cards, or being a Militia. 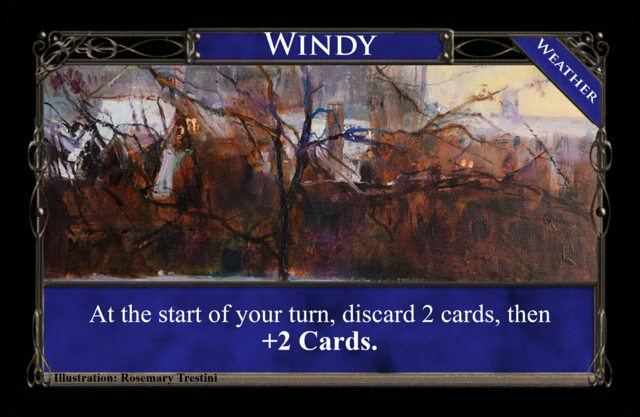 Two little comments on the Weather cards: I like how Windy is similar to the Wind's Gift, and in your flavor text for Calm you use the word 'often' twice. Anything I didn't comment on I like. Overall a really good set. 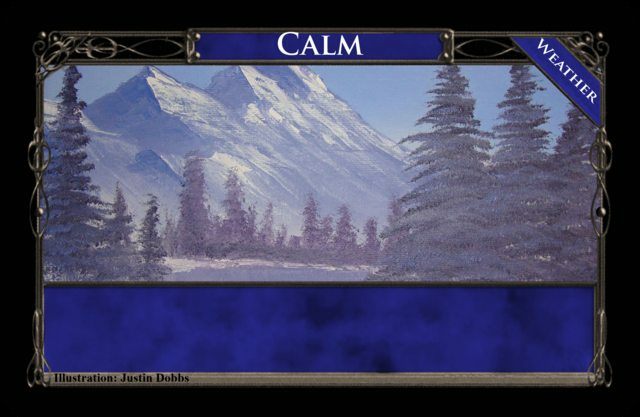 Astronomer: While it does become really good on Calm turns, remember that Calm only occurs on about 1/3 of turns. Getting a lot of Astronomers for this will result in a deck full of pricey Smithies most of the time. Also, Dark turns them into Moats, and Icy means you can only play one anyway (as it won't give you an Action), which means a stockpile of them will be even worse on these turns. I know it's the same for Smithy, but Smithy isn't generally stockpiled unless there are plenty of Villages and such. Carolers: I had been switching back and forth between gaining the Coppers first or second. If I ever get to playtest this, I'll try both permutations. Elven Forest: I've already been thinking about re-costing or re-effecting this. Reducing it to $4 and reducing the Craft bonus to +2 Crafters would still give it the "free Victory card" effect I've been wanting. Alternatively, I was thinking about keeping it at $5, but you would get +2 Crafters whenever you gain it, Crafting phase or not. Factory: I like your idea of an optional skip to Crafting for the extra Crafters. The card is pretty wordy as it is, but I'll give it a try. I did originally have it just skip to the Buy phase rather than Crafting; I could go back to that, too. Furrier: The more I thought about Furrier, the more I think it's a pretty swingy trasher. If you open Furrier/good-card and reveal good-card with Furrier, you certainly wouldn't trash it. Otherwise, you'd easily trash the three cards most of the time. With good/bad luck, one Furrier player could be stuck topdecking everytime while the other gets a nice svelte deck. This will need testing for sure. Holiday Village: Yes, that was the intent to give a Silver rather than just give money. I sorta wanted this to be a Village that's not explicitly intended for engines. In fact, it might almost be an anti-Engine Village with the Attack Cursing, Silver flooding, and no effects with other Action cards. Homestead: Good advice. I still want some feedback on whether the helping mechanism is too strong for the other player(s). Krampus: The more I've been thinking about this one, the weaker it seems. For one, it doesn't stack; once the opponents have 4 or fewer cards in hand, it's done attacking. For two, if the opponent avoids Attacks entirely, it's basically a half-Militia all the time. 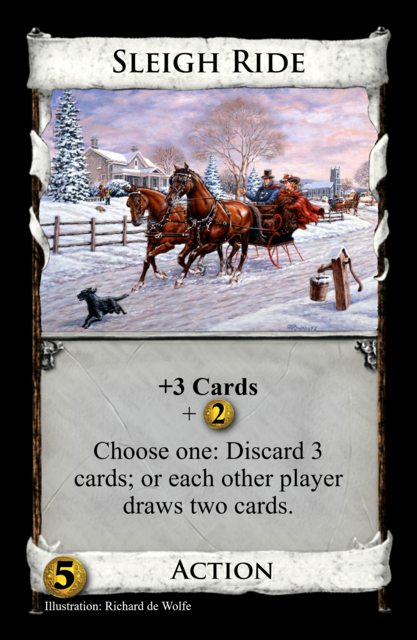 For three, as you noted earlier, having too many Silvers can clog your engine, so this is a non-Engine-friendly card compared to Militia. Philanthropist and Potato Farmers: What's wrong with politics? ...Wait, don't answer that. Sewing Circle: I should check out the Ice Age cards more. 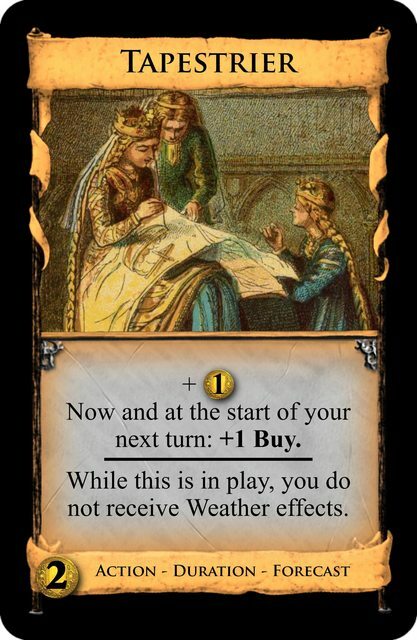 Tapestrier: Originally, I had this as, "While this is in play, you may choose not to receive Weather effects." That way, you can still receive Warm and Magical, but avoid Blizzard, Very Cold, and the like. I was wondering if that made this too strong and too much of a necessity, though. Windy: Thanks for noticing that! Overall, thank you so much for the feedback! I'm considering a thinning-down of the Weather deck. Currently, it has 9 Calms and 2 each of the rest. I think it would be more efficient to basically halve this to 4 Calms and 1 each of the rest. Also, I'll take Aquila's advice and make the first 2 turns Calm by default; the Weather deck will not come into play until Player 1 starts their 3rd turn. I think it would work to force two of the calms to be at the top of the deck, so there will only be two more calms before the first reshuffle, instead of not using weather cards for two rounds, if that's what you were going for. Sort of, but I also want there to be more Calms in the Weather deck during post-T2 play. Perhaps have 6 Calms and force 2 on top? It's snowing here. You were just in time! I've figured out how to use Tabletop Simulator to some extent, so I've had some luck at playtesting my cards. So far, I've only played by myself (controlling two players at once); once I get more savvy with TS, I might invite others to help with the playtesting. Chimney Sweep - Big fan of the way this plays! I do think, disregarding the player interaction, the on-play should be worth the $2 cost along and usually +1 Buy and +$1 isn't worth any price. 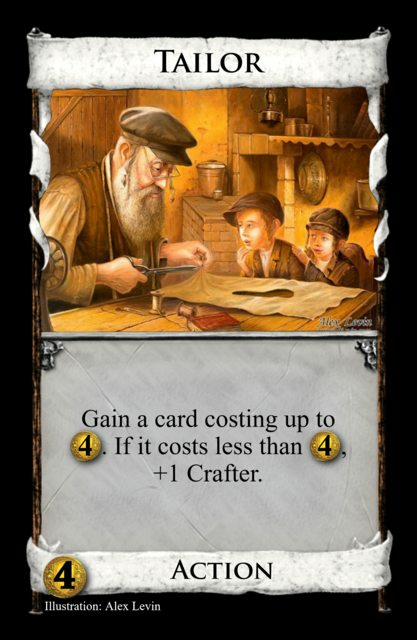 Peasant is only worth it because it upgrades into far better cards and Herbalist, even with it's occasionally useful Treasure top-decking, is generally considered one of the worst $2 cost cards. Even though this is a great value at +1 Buy and +$3 if you get another player to trash, I fear it is so devastatingly weak if that doesn't happen that opponents will forgo trashing just to punish you. In other words, there might be more value in it for them to potentially hurt your current hand then help their future hands. If that's the case then no one will ever buy these. Having it cost $3 and provide +1 Buy and +$2 on-play and then the extra +$1 for other players trashing seems quite far. Of course this is just me speculating. Play-testing would reveal much more than my hypothesizing. Thanks for posting these great cards! Carolers: So far, it seems okay, but that's just me. Literally. I think I need other humans and their willingness (or lack thereof) to dump their Coppers to truly playtest this for real. This goes for pretty much all of the "help your neighbor" cards. Chimney Sweep: You may be right, Kudasai. Trashing a card out of turn is nice, but it's probably not enough of an incentive to justify giving your opponent $2. I still want Chimney Sweep to cost $2, though, so I'll consider some other versions. Again, this also needs more human testers. 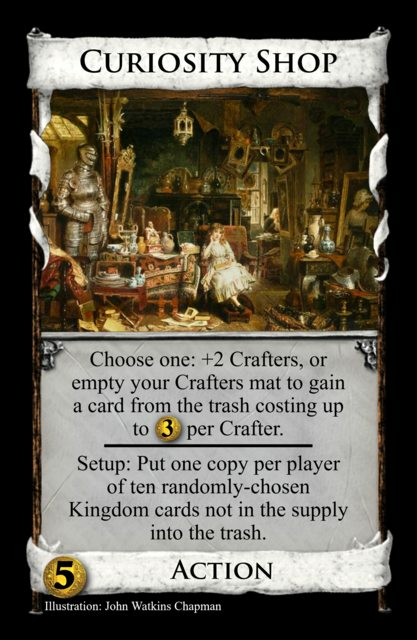 You may go immediately to your Crafting phase, to Craft a card from the Trash costing up to $3 per Crafter returned. 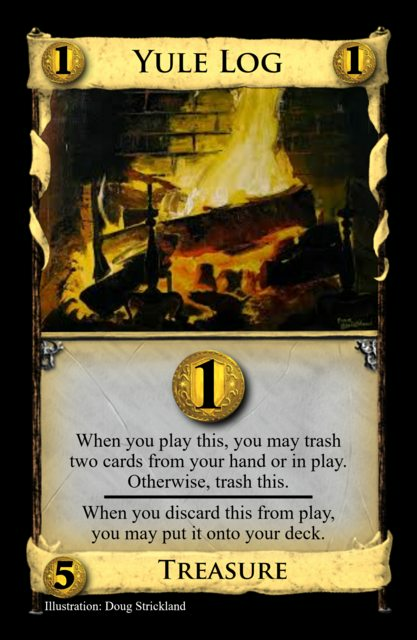 Setup: Put one copy per player of ten Craftable Kingdom cards not in the Supply into the Trash. I have a feeling Curiosity Shop will go through many iterations before becoming acceptable. 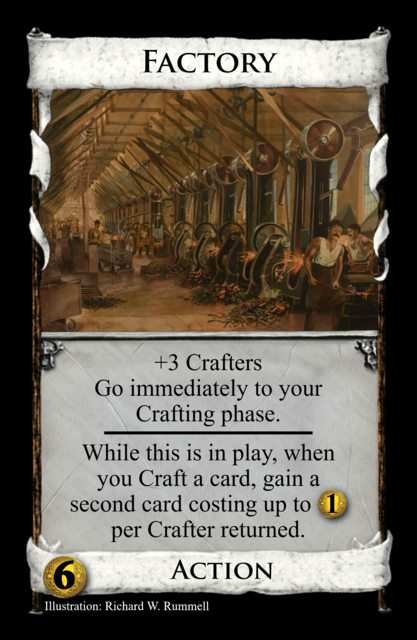 Factory: With another source of Crafters in play, Factory is pretty strong as you can easily gain Provinces and a second decent card. Without them, though, Factory is a bit more of a chore to make work. I like it where it is now, but it still needs a lot of testing. Furrier: This one may be a bit too swingy. Early trashing is very important, but if Furrier hits your other good opening card, it can be pretty much useless unless you're willing to give the other card up. Weather control is nice, though. I may give this the Navigator effect, but have the Weather viewing first so that you have an idea whether your next hand would be affected by the Weather. I'll finagle with it in any case. Homestead: Yeah, allowing opponents to draw on non-matches is just too strong for them. I'll try changing it to draw matching cards instead. Ornaments: Yes, the $4 version is so much better, yet not brokenly so. I'll officially change the card on the first post. Sewing Circle: Maybe a little strong, especially when Throned. Still want to playtest it some more to be sure. 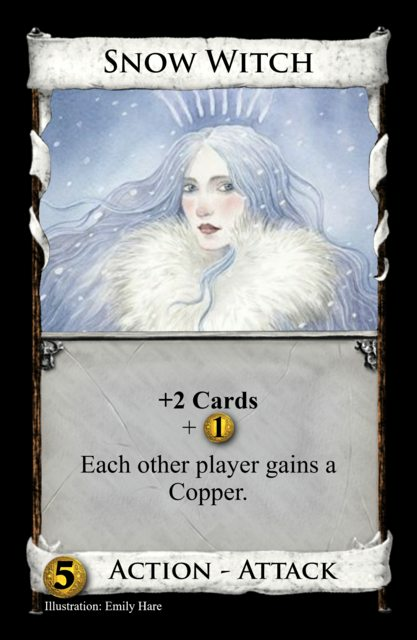 Snow Witch: Yes, the "gain a Copper" version is so much better, yet not brokenly so. I'll officially change the card on the first post. Tailor: Turns out to be a pretty good card for Alt-VP games like Feodum, Gardens, and Silk Road. Weather: 6 Calms and 1 each of the others seems to be a pretty good setup, as does having the first two turns always be Calm. 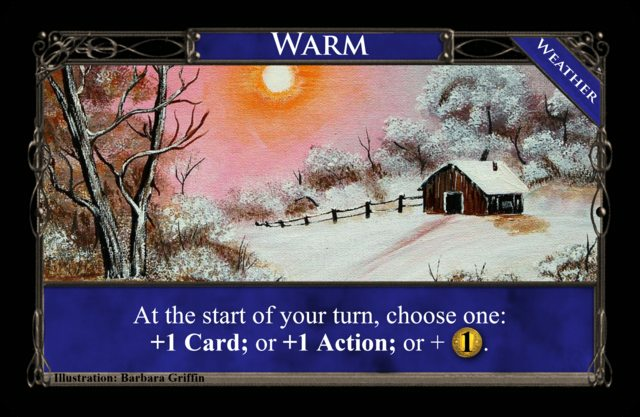 Warm: The +1 Card option seems to be a little too popular, at least in the games I've played with so far. +$1 seems a bit weak, too. I may try adding +1 Buy to the +$1 option, or even remove +1 Card and replace it with +1 Buy. Any cards without comments haven't been playtested enough yet to make a serious observation.